Perhaps that header image is a bit deceiving since the game a lot of the staff is playing is mobile - that said - you get the point. There must be some mathmatical equation relating to games that have the word "Souls" in the title and how much time you need to spend in them. Andrew spent 40 plus hours with a demo for Soul Sacrifice - so you get the point. Nick Puleo (@NickPuleo) - "If I get time I'll be playing some Leviathan: Warships and possibly some Strike Suit Zero in short bursts." Andrew Gaskill (@cubninja) - "Soul Sacrifice so hard. Gonna have me some fun with Far Cry 3: Blood Dragon, too. " Mike Katsufrakis (@Pheriannath) - "Spring cleaning, site coding, and some Soul Sacrifice if I can fit it in. " Marc Allie (@DjinniMan) - "I am hoping to get deeper into the Sanctum 2 test build this weekend." Jason Love (@JLove55) - "Vacation!!!! Yes!!!! So whatever games I can stuff into a suitcase for my 3DS (Etrian Odyssey IV is the most likely choice) and Star Command (the FTL-like we deserve, but not the one we need) and hopefully Leviathan: Warships on the iPad. Plus lots of board games." 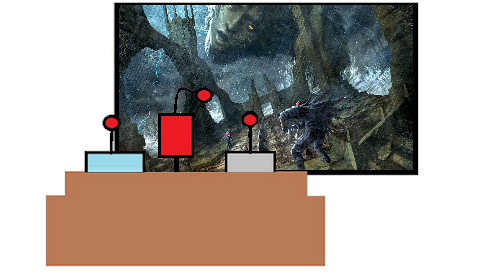 Eric Murphy (@smurph_em)- "Halo 4, The Walking Dead, and possibly Borderlands 2. I'll also be playing a very disappointing co-op game called Waiting for Monaco on XBLA." Sam Tyler (@reelsamtyler) - "My run of great games continues with 007 Legends, but thankfully I have also bought some Star Wars tables for Pinball FX2. On the co-op tip; Borderlands 2." Locke Vincent (@LockeVincent) - "Headed to the mountains to get out of the city, but I'll have Soul Sacrifice at my side while I'm on the road." Tally Callahan - "Splitting my gaming time between Neverwinter and Soul Sacrifice for upcoming review." Chris Metz (@The_Lemko) - "My weekend will mostly be taken up by a religious holiday, but I hope to spend a little time in BattleBlock Theater." DJ Waaland (@FusRoDJ)- "Gonna get farther into Soul Sacrifice and Dragon's Dogma: Dark Arisen." John Bardinelli (@itsamejohn) - "It's Sanctum 2 time with Marc!"